Feb 03, 2016 (LBO) – Assistant U.S. Trade Representative for South Asia Michael J. Delaney met with Sri Lanka government, trade, and business officials this week ahead of the upcoming Trade and Investment Framework Agreement (TIFA) talks in Washington. Delaney met with Minister of Development Strategy & International Trade Malik Samarawickrema and representatives from the Ministry of Foreign Affairs, the Ministry of Public Enterprise Development, the Board of Investments, the Department of Commerce, and the Prime Minister’s office to discuss ways to increase trade and investment. He discussed labor issues with representatives from unions and the Ministry of Labor and Trade Union Relations, as well as listened to perspectives from the private sector with members of the American Chamber of Commerce. 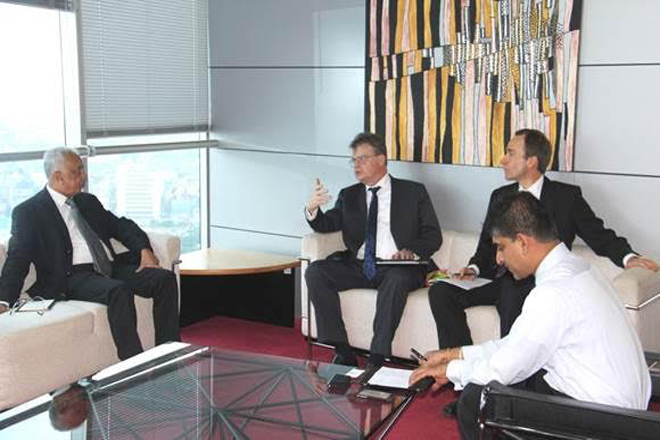 Delaney also touched upon intellectual property rights during his meetings in Sri Lanka. Trade and Investment Framework Agreements provide strategic frameworks and principles for dialogue on trade and investment issues between the United States and partner countries, a statement said. Agreements serve as a forum for the United States and other governments to meet and discuss issues of mutual interest with the objective of improving cooperation and enhancing opportunities for trade and investment, it said.